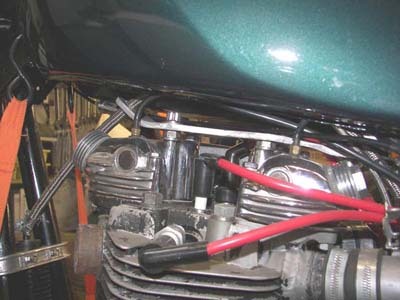 The picture below shows the one off aluminum head steady, which is bent up at the front of the cylinder head to keep the return oil line from the Norman Hyde oil cooler away from the exhausts. If you look close you will notice each rocker box has breathers attached to the top of them. NOTE: All pictures open in a new window when clicked on. 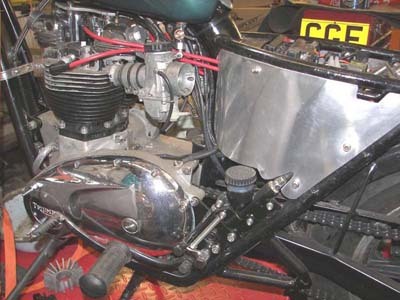 This picture shows the new aluminum side panels that I made to replace the standard Triumph ones. The master cylinder for the rear brake is from a beemer (bmw), made by brembo, fitted with an inline brake switch. A picture of the right hand side panel, this has the ignition switch and the lights on / off switch in it. You might also notice the oil pressure gauge fitted in behind the engine. 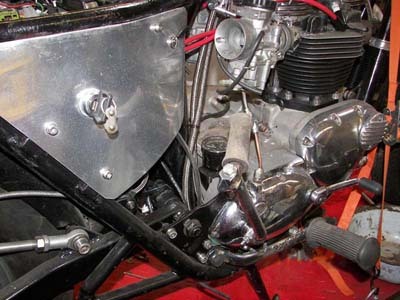 After experiencing a Triumph crankcases filling with oil when the scavenge side of the oil pump stopped pumping oil back to the oil tank, I have fitted an oil pressure gauge to every Bonnie I've owned since. It can be a bit freaky, when you see the pressure drop on tick-over after a hard thrash however a quick blip of the throttle reassures you that the pump is working fine.